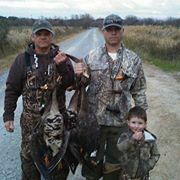 All of our guides, along with their well trained dogs,have several years experience guiding clients in the rice-fields of SW Louisiana. You will be hunting out of dry, well-brushed pit blinds that you will be transported by ATV to and from. We are a kid and family friendly operation. We look forward to earning your business by putting forth our best effort for our current and potential customers.